Are you tired of watching movies or listening to music without clear sound? The LuguLake Portable Bluetooth Speaker with Stand Dock offers a quality sound experience with many conveniences like easy bluetooth connection and a convenient built-in stand to support a variety of mobile devices! See what Emilee at Deals of Sweetness thought about this great bluetooth speaker! 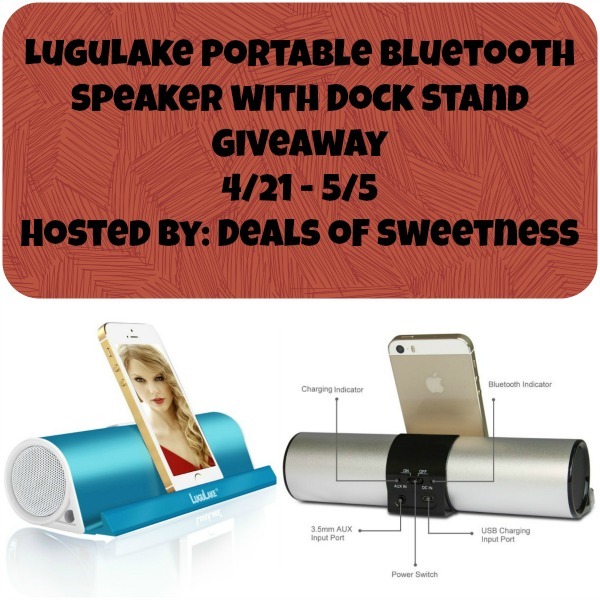 Would you like to win a Portable Bluetooth Speaker with Dock Stand from LuguLake? This giveaway will run through 5/5 at 11:00pm Eastern Time and is open to US residents ages 18+. Winner is subject to eligibility verification. Winner will be notified via email (consider adding dealsofsweetness@gmail.com to your “Safe List” as winning email notification will be sent from this email.) and will have 48 hours to confirm before a new winner will be drawn. Please refer to the full terms and conditions in the Giveaway Tools. I ould definitely use this at work. I would use it outdoors on the porch, when we travel and also around the house. I would love to have a speaker on my patio! I love to listen to music when I’m cleaning, so I would love to have this speaker on one of the book shelves to play music from my computer in the other room. Would use this to listen to my music when I work out. I would use it while I clean house and outdoors!